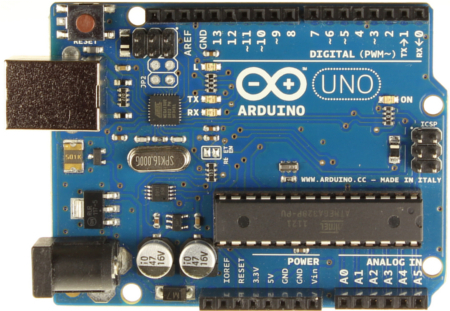 The Arduino Uno is the most common of the Arduino boards. It is based on the ATmega328P microcontroller. The Arduino Uno has become one of the most popular Arduino boards and is now in its third official revision. It is available in DIP and SMD configurations and supports a wide range of shields. There are also many third-party clones which use the same layout and specification. Use this tag when asking a question about using Uno boards (or exact clones). For example, asking about shield compatibility or pin configuration. Alternatively, use the arduino-uno-smd tag when the question is specific to the surface-mount version of the Uno (as opposed to the DIP version). Arduino/Genuino Uno is a microcontroller board based on the ATmega328P (datasheet). It has 14 digital input/output pins (of which 6 can be used as PWM outputs), 6 analog inputs, a 16 MHz quartz crystal, a USB connection, a power jack, an ICSP header and a reset button. It contains everything needed to support the microcontroller; simply connect it to a computer with a USB cable or power it with a AC-to-DC adapter or battery to get started. The "Input Voltage" above refers to the power input (to the power jack), not the amount of voltage you can put on the input pins (which is a maximum of 5 V). The six analog input pins can also be used as digital pins, so you actually have 20 pins that can be used for digital input/output.